Staying in the town of Brecon right in the heart of ‘Big Sky’ country, meet your Tour Leader and fellow walkers on Friday evening for a welcome drink and dinner. Saturday morning dawns and after a hearty breakfast our coach takes us the short drive over to the small welsh town of Bwlch. Striding out we begin with a short climb up Mynydd Llangorse and our first views down to Llangorse and its lake, the largest natural lake in Wales. To the west, view the highest range of Peaks in South Wales including Pen y Fan, Corn Du, the Cribyn and Fan y Big while to the east we can see the Black Mountain Range. The path then continues along the hill top and down the ridge to the village of Llangorse for a pub lunch (own cost). This afternoon we head back via the banks of the lake and over the top of Allt Yr Esgair and the Iron Age Fort; said to be constructed sometime between 800BC and the arrival of the Romans in the AD70s there are more fabulous views over the National Park. Sunday we head out on one of the finest walks in the Brecon Beacons. 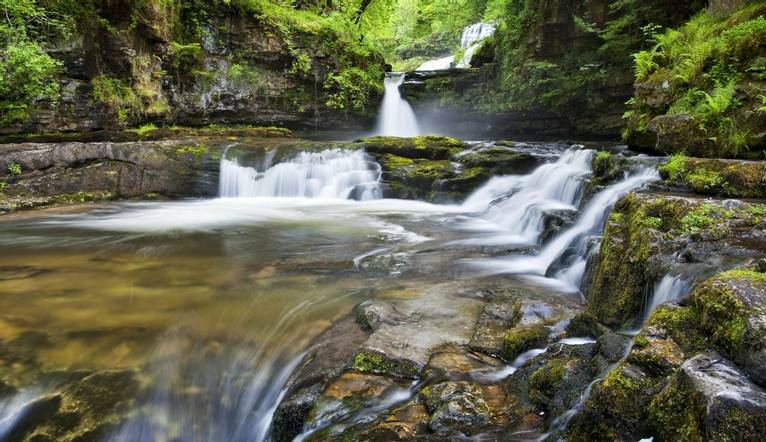 The path takes us along hidden tracks and deep woodland to stunning waterfalls including Sgwd Clun-Gwyn, or ‘fall of the white meadow’ and Sgwd Isaf Clun-Gwyn along the River Mellte and River Nedd. Starting from Cwm Porth we visit the cave entrance of Porth yr Ogof before walking along the River Mellte. Roughly half way along the route we stop for lunch (own cost) at the Angel Inn in the small village of Pontneddfechan before carrying on round past further waterfalls. Once an 11th Century Norman Castle and then a former coaching inn, this now gorgeous hotel was once one of the first ‘modern’ hotels in Wales. It sits on a prominent hill in the heart of the town of Brecon with views of the river Usk and Brecon Beacons in abundance. Sample one of the locally brewed lagers in the bar or on the sun terrace while the restaurant serves a locally sourced and freshly prepared menu. Our guest rooms all feature LCD TV, safe, heating, ironing facilities, tea/coffee-making facilities and hairdryer. Free Wi-Fi is available in the public areas. There is often confusion on the question of gratuities, since it frequently depends on the type of holiday, location and, of course, your attitude towards tipping, as to what is normally expected. In order to give you a rough idea, we have given appropriate guidance below. The Tour Leader will be on hand to offer advice or suggestions if required but gratuities are offered entirely at the sole discretion of the individual. We suggest a group collection at the beginning of your holiday to cover drivers, guides, porters and hotel staff (including restaurant, kitchen and reception staff) of approximately £15. Your Tour Leader will collect this on your behalf and distribute it accordingly, thus relieving you of the burden of who, when and how much to tip. The tipping of bar staff and housekeeping will be left to your individual discretion (the rounding up of the drinks bill and a small amount left in your room on departure should cover this and would be much appreciated). For any meals that are not included in your itinerary, restaurants expect a 10Ͽratuity (do check that service has not already been added to your bill). For taxis 10Ͽf the metered fare.